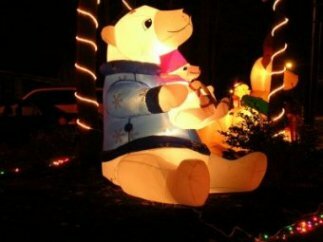 You've seen them everywhere: tacky Christmas decorations. When your parents make you drive through the neighborhood to "see the lights" you are forced to gaze at the millions of watts of Christmas lights, thousands of acres of fake snow, hundreds of plastic Santas. Somewhere in the back of your mind, you think to yourself, "I can do better." Well, now you can! Collected from thousands of years of Christmas experience, I have compiled the ultimate guide to tacky decorations. In just hours, you too can have your own masterpiece. The number one rule to remember to ensure a tacky Christmas is: avoid mediocrity. There are too sides to the spectrum: either have too few decorations, or too many. This is easily explained with the following graph. The first thing you need to remember is that they are not Christmas decorations as much as they are holiday decorations. 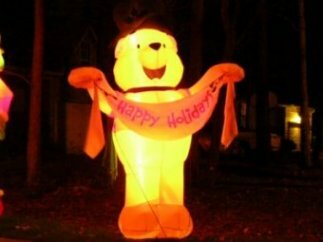 This "Holiday" includes Christmas, Kwanzaa, Chanukah, New Year's Day, Veteran's Day, Thanksgiving, Halloween, Election Day, and Easter. It is vital that you have your decorations at least partially set up by December 26th, because we know, as Americans, that Christmas is all that matters. It's our only reason for living. 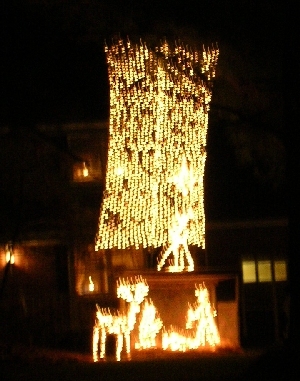 Net lights became a hit about 3 years ago. The simplicity of these illuminated bush-covers are appealing to the lazy holiday lighters. No longer does one need to toil for hours untangling and placing lights inch by inch. Now, with modern (sometimes faulty and fire-starting) technology, all that is required is a simple toss and a plug and you and your family can enjoy hours of semi-evenly distributed holiday lights. The number one rule to remember about net lights is that you have to make them look square. 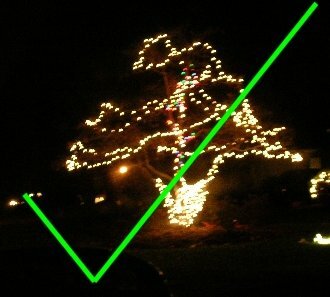 This is easily done by making sure that the tree or bush that you are placing them on is not big enough to be fully surrounded, and that the corners of the lights are easily visible from a distance. This is pretty easy to do; just make sure that when you have two or more conjoining nets over one bush/tree, you have a small noticible strip of darkness running down between them. Also a good example of the worn colored lights effect. This is not a very good example of light seams, but you can get the idea. 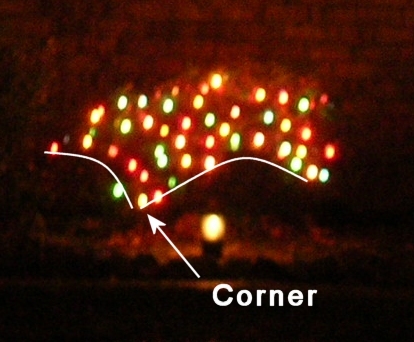 This is one of the easiest ways to turn lights into tacky lights. For those of you who like a challenge, may I recommend that you look at the following Christmas concoction. This is the first time I have ever experienced this beautiful technique, and I am humbled by it's greatness. I would like to take this time to thank the engineer of this nativity scene for his bravery and commitment to the Christmas season. I challenge everyone to try to do better than this example. You've raised the bar for all of us buddy. 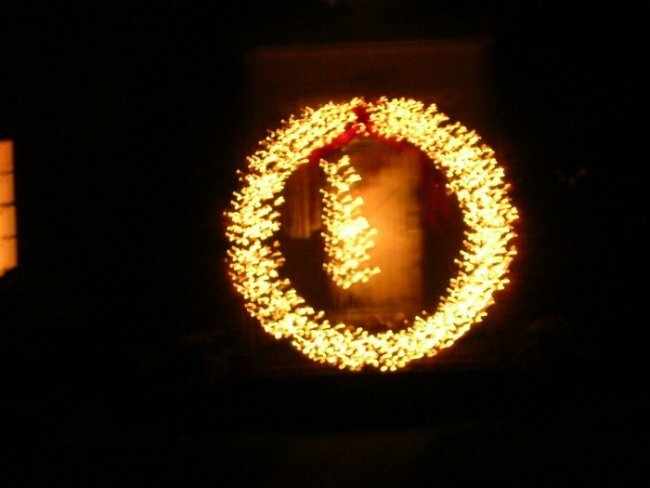 I would not recommend that anyone who enjoys fully functioning spinal cords attempt to replicate this decoration. Remember though, some things come before personal health. Although less extravagant than net lights, strand lights are a good cheap substitute. 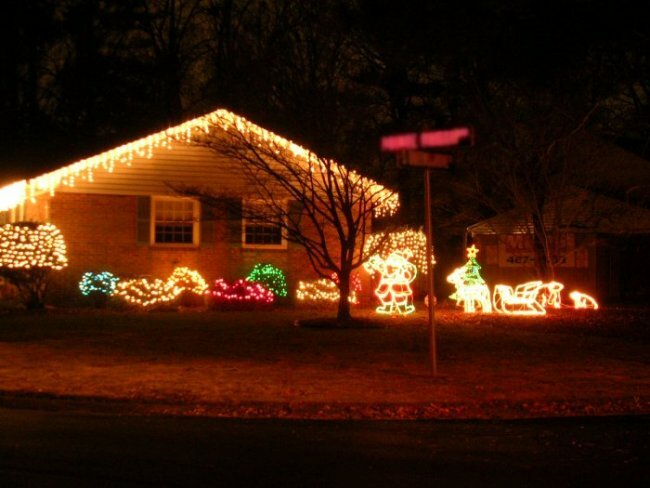 Some people just don't realize the efficiency of using very few lights: they take seconds to set up, cost very little, and don't have to be untangled. When you can skate by with two or three strands, why go for anything more? When using very few lights, it is important that you make them go a long way. Two strands of lights: $15, amount of effort 8 minutes, Christmas done right: priceless. Wrapping trees is the most time-consuming way to hang lights. It is best done by only giving a general idea of where the tree is, and not bothering to give the finer details. This does not mean that you should not wrap the trunk fully, though. Because the trunk is the easiest part to wrap, make sure that it is completely covered. 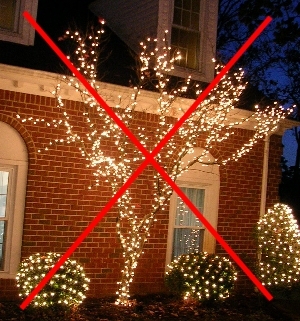 After that, just sling the lights around the outermost branches to get the best effect. This tree is too well defined; it's obvious that a significant amount of time and meticulous effort went into it. This is not what we are looking for This is much better. 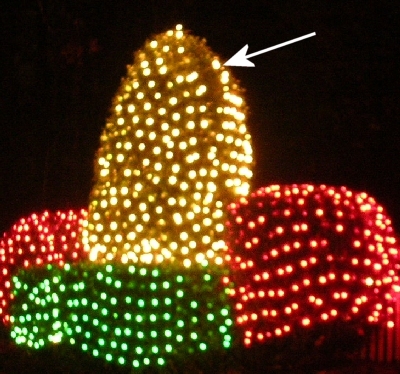 May I also point out the small strand of colored lights going up the center. Very nice. Often times it's easier to buy different colored strands of lights rather than the same color. If a box of 100 yellow lights is on sale, buy it! You can add it to your collection back home! Wait! Blue isn't a Christmas color! Blasphemy! This is an almost accidental art form. See, most strands of lights come with these extra bulbs that are not really extra bulbs, but most people think they are. They're really blinking bulbs. Behold, the blinking bulb! 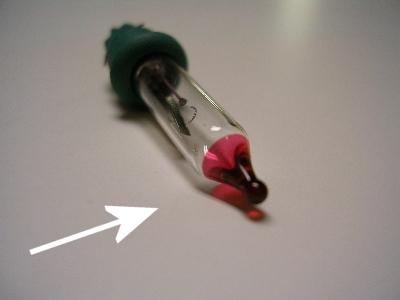 (notice the red tip). Snap one of these babies in on the first socket in the strand and your whole strand will be blinking. Even better, put it in the middle so that only half the strand blinks. This can be done anywhere, is extremely attractive, and is easy to do! Sorry for the slightly seizure inducing animation. See if you can spot the blinking strand. 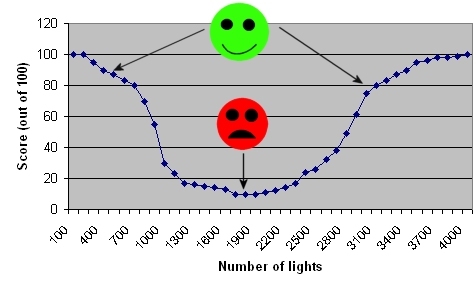 Of course, lights don't really explain the holiday. How much of a story can you get out of 100 watts? This is why lawn figurines were invented. These petite plastic people are perfect for populating your...front yard (damn!). If you plan to buy some of these ornaments, make sure to get some used ones that have burn marks from where the light bulbs got too close to the plastic. A blowtorch can quickly create this effect if your local flea market is out of used ones. They come in a large variety of characters: from Santa and Frosty to Jesus and Rudolf (actually, I think that's all they make). The most important of these, of course, is Santa. Unfortunately, I was only able to capture two of the varieties. It's vital that you display your holiday pride with at least two plastic Santas. 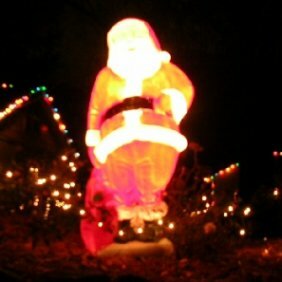 If you really want to get in the spirit, make sure that at least two Santas are visible from any given point in your yard. 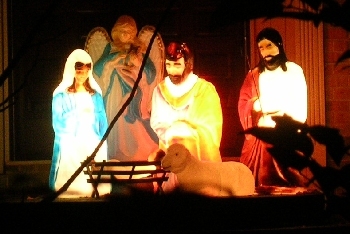 What always bothered me about nativity scenes is that you're not supposed to put the baby Jesus in until December 25th. This would make sense, but did they really just stand around and wait for a baby to appear? I have a feeling that it was a little different. 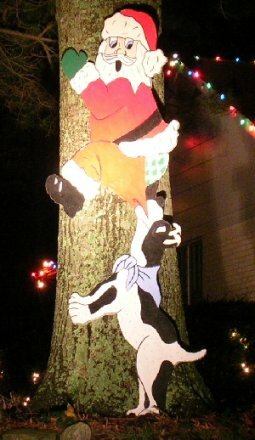 I was amazed to find that some people decided to make their own ornaments out of plywood, the end results were quite nice. This is why Santa usually doesn't use the front door The ten trillion candle power spotlight makes it kind of hard to see Santa (it must be so hot inside that suit). With his abominable spirit, he manages to smile and wave even when tied to a flagpole and left to starve. Because of problems with storing hundreds of plastic and wooden figures, God invented inflatable ornaments. These can become quite life-size and are able to fit in a shoebox when deflated. 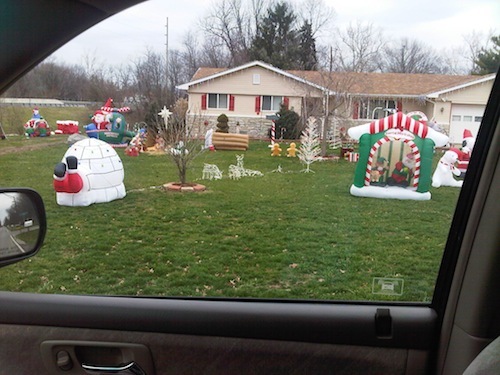 One house in particular was where I got most of the pictures of the inflatable ornaments. That is the last house in the review seciton. Nothing says I love Christmas like the Grinch (I mean at the end of the book). For those of you who don't read, the book was much better than the movie. Here, the Grinch is pictured with his abused dog companion Max. This is the biggest Santa I think they make. 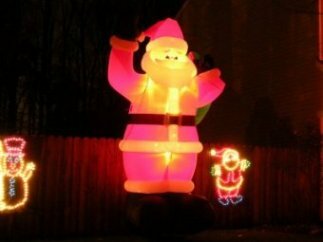 To better illustrate his size, he is pictured next to his Christmas light-lit 6-foot high counterpart. Oh, I just thought of a great idea for a horror movie. 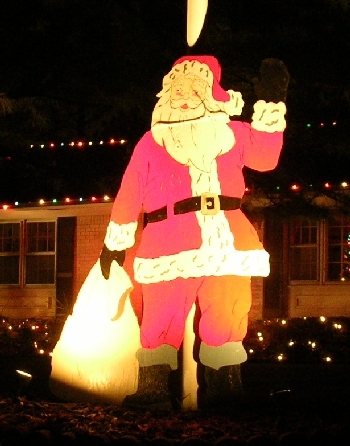 Here Santa is pictured with a rather cross look on his face. I can almost hear him scream "Move your lazy asses ya' stupid reindeer!" These polar bears would be much more marketable if they were holding Coke bottles. Here is Winnie the Pooh! Everyone loves the Pooh! (Note to future self: name your son Pooh). 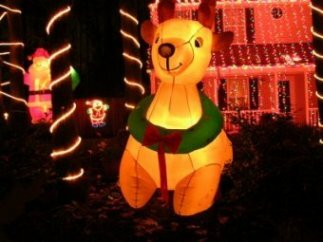 Unfortunately, the genetic alterations and radiation exposure which enables the reindeer to fly has augmented the size of their pectoral muscles to the point that it has become impossible to walk. 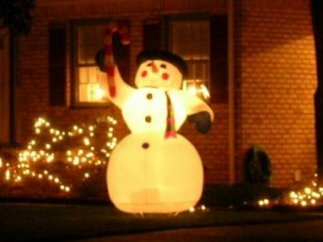 Here frosty is seen casting his candy cane to heavens as a sacrifice to the sugar gods. Frosty is an interesting name. I would love to live in a world where people where named with adjectives that described them. My name would be Tallie. 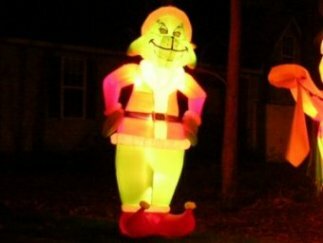 Here I have reviewed several bad examples of Christmas decorations (people in my neighborhood just don't get it). 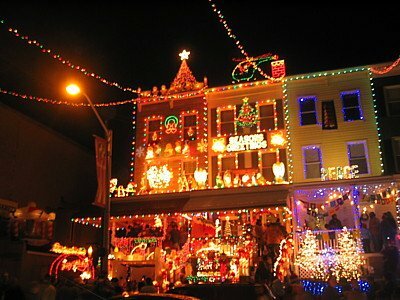 This festive house is slipping into the un-tacky genre. 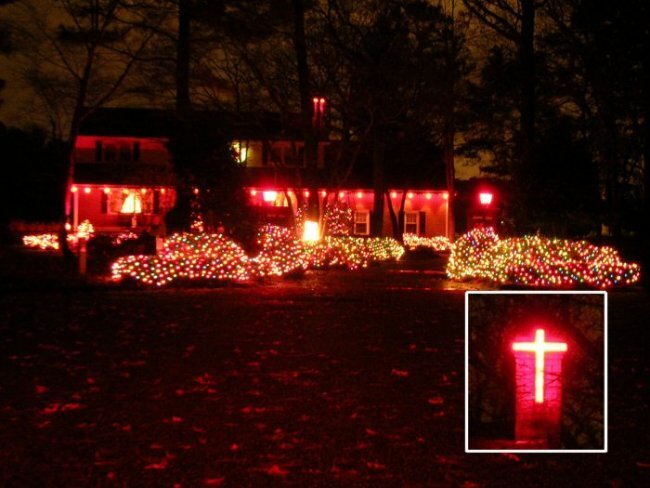 The saving factor would have to be the red bulb things hanging from the lower end of the roof, and the surprisingly religious cross hung haphazardly on the chimney. They had better take the cross off by Christmas, though, because Santa will have quite a time working around it. This house is an excellent example of the different colored light technique. It looks as though their meager collection of lights was made from the bottom of the rack at Wal-Mart several years in a row. Also notice the oddly shaped figures in the background; they look like a hooded peasant mother and daughter picking up the scraps of seeds from the already harvested fields. 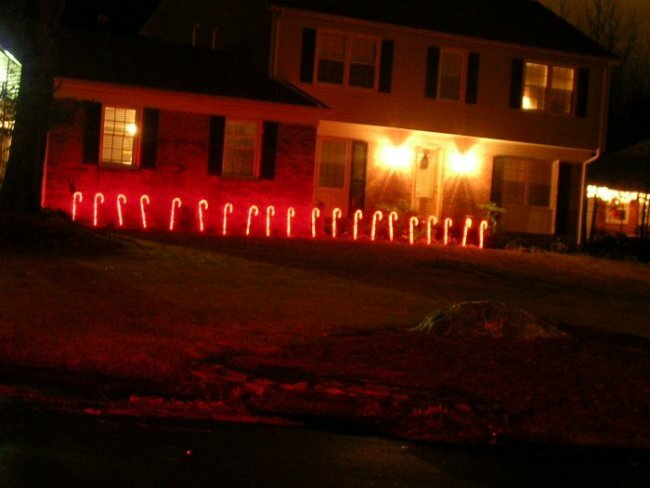 I absolutely love the Candy canes on their walkway, but the uniformity ruins the effect. Alas! The perfect house. The owner of this house decided that he should go big, or go home (er...away). There are approximately 32 strands of super-density lights on the house. 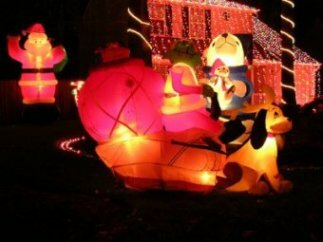 In the front yard are seven, count them seven different inflatable figures; this house sounded like a wind tunnel. Finally, somebody gets it, I dare you to try to compete with this house next year. Well, there you have it, the ultimate guide to Christmas decorations. I hope that you use this guide in the future to create the ultimate house. See you next year! 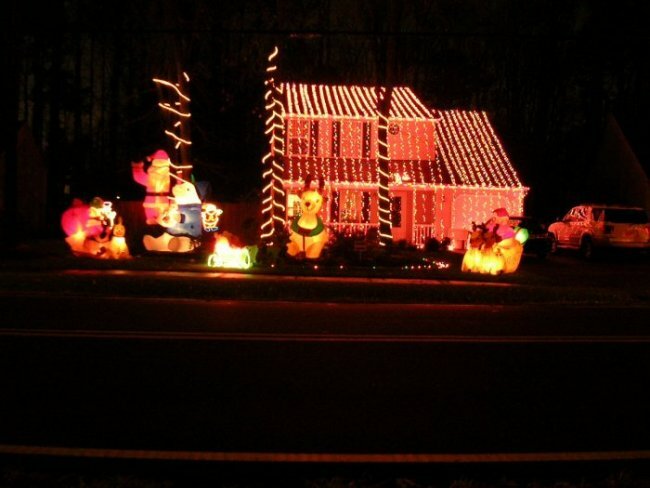 (If you have any pictures of your own of tacky houses, please send them in). 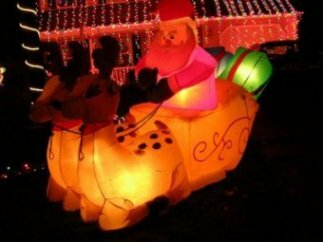 David sent this picture in and had this to say "Here's a great example of the "Mostly Inflatable" motif."